It’s the final Tour Tweets of the Week for 2017 – and it’s a bumper crop. 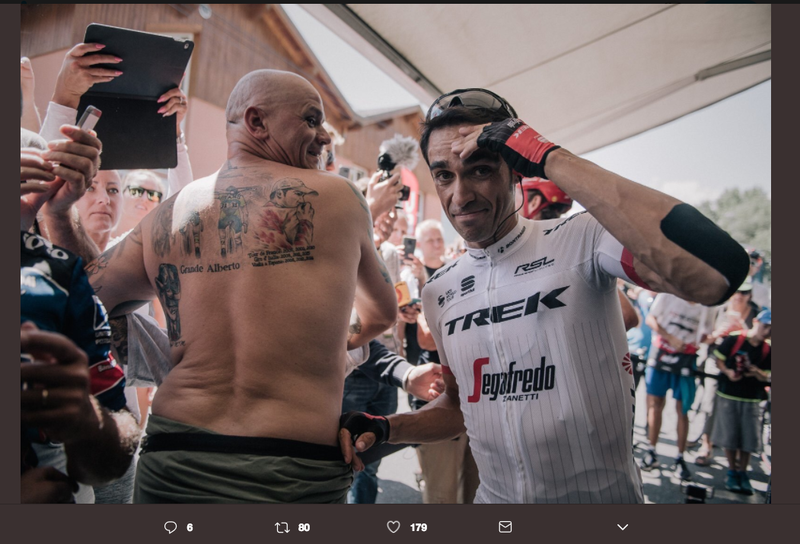 We have Kwiatkowski and Froome pleading to #FreeLanda, WaWa Barguil takes the pox and hearts, Bedhead Bardet gives it all – and we’ve got it all – all except podium pictures, that is. #TDF2017 🇫🇷 / Belle photo de 🇫🇷 @WarrenBarguil (SUN). Romain Bardet giving interview to guy with mic on back of motorbike while sat with feet on dash in team car haring down mountain. Chapeau! Someone calm Bardet down! He looks like he's panicking! I love that Bling has that weird bemasked alien plushie under his arm while carrying around his post-stage chow. But what a wonderful bromance between Bling and WaWa. 🎩🙋‍♂️ <— That's me taking my hat off to @WarrenBarguil. What an impressive @LeTour performance! Massive congratulations! Nothing but class from Thomas De Gendt. I have respect for other riders performances. He deserves the maillot a pois. Congrats with the stagewin. At least Macron didn’t try that knuckle-busting handshake that he gave a certain orange clown a few weeks ago. It was announced on Saturday that Barguil had been awarded the Overall Combativity Award, with 4 votes to 2 for Thomas De Gendt. One of the two votes was for the fans vote. And this is what TDG said. From now on @DeGendtThomas will be my most combative rider in every race, even races he's not in. 1000k off the front in this TDF. Everyone wants to #FreeLanda but more importantly, Sky definitely want to make sure they keep Kwiatkowski – my MVP of the Tour. During Saturday’s time trial, in which Kwiatkowski finished second overall – 1sec off the winner Bodnar‘s time. Which prompted this tweet from Dr Hutch and the reply from Cillian Kelly. It’s not an easy decision to abandon because of injury but even when you’ve made the decision, it still hurts a lot. A great rider and person @marcelkittel had to leave @LeTour in a bad way… thanks for putting the 🇩🇪flags up mate. Good recovery! Luckily, Marcel was able to bounce back, with the help of chips and, um, mysterious meat products. This was Voeckler’s last Tour – I remember his first stint in yellow, oh about 13 years ago – time flies when you’re in the break. The Voecklerians will beam up their golden child and the mothership will leave Earth's orbit for the last time tonight. Cyril Gautier decided to brave the wrath of the UCI (remember the Giro – U for unromantic?) with his final stage proposal. I love this little film. Really love it. Yoann Offredo greets his (very big) family as he rides the final stage to Paris. Philosophical question: If a shirtless old man astride a vintage tractor is not seen by NYVelocity, does he really exist? @nyvelocity You saw that, right? Shirtless old man astride a vintage tractor! Not sure I like tractors in a supporting role. From one Aussie green jersey winner to another – Bling is part of Robbie‘s crew now. And speaking of Robbie McEwen, the fans in Australia might have to stay up to crazy o’clock to see the Tour stages but they do get Robbie commentating the races – I’m so jealous! The Colombians of their dreams – I love this video. 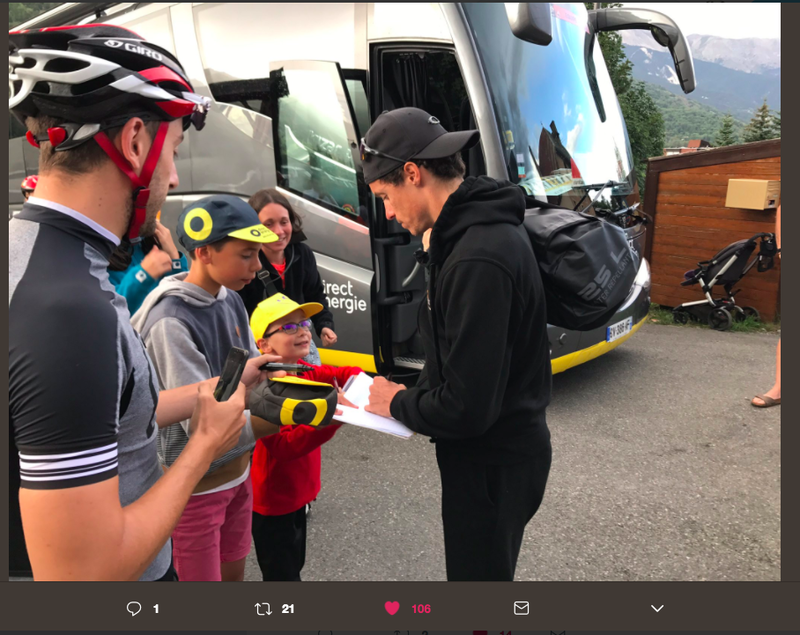 The little kid in the red teeshirt – his face when meeting Sylvain Chavanel!!!!! 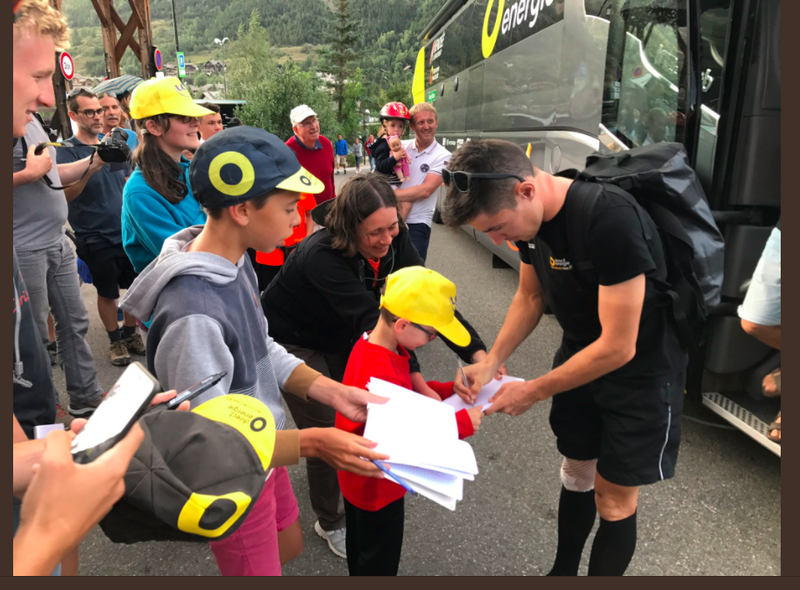 Absolutely adorable – and after a tough stage for the Angry Cats, they still signed away for all their fans. Billions and BILLIONS of viewers for Tour de Yorkshire! I’m personally taken with the pedaling fraise de bois!! This is the only time I’ve seen Esteban Chaves in this Tour. Let’s hope he bounces back for defense of his Il Lombardia title later this year. I’m fairly sure that Kaitlin de Kort and I would be best friends if we ever met. She has the right priority! Ah, the return of Wei Yuet and his gorgeous photographs!